Sonic V.S Sonic. . HD Wallpaper and background images in the Ёж Соник club tagged: sonic hedgehog. short vs tall , old vs new, green vs black, fat vs buff, spiky vs smooth(drawing), and i cant think of any others. Um, the samll one was from Sonic SatAM, The Adventures of Sonic the Hedgehog and Sonic Underground. And the tall one is from Sonic X. I watch each series. Old sonic - short, abit fat, 3 quills pupil eyes. New Sonic - Tall, skinny, 6? quills green eyes. O_O huge change. Well I love them both!I'm friends with AzumiAngel at DeviantArt, the one who DREW this! 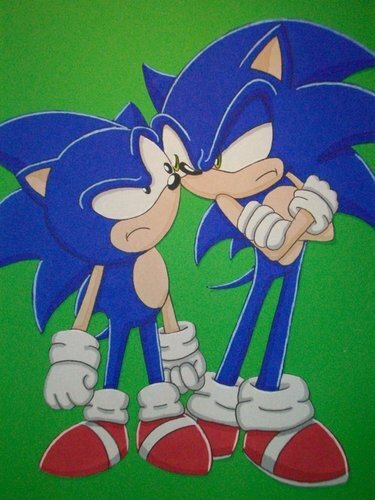 and sonic generations was created!